No timetable set for implementation of withdrawal process which Order says is due to declining membership. The Dominicans in Ireland have announced that they are unable to maintain their presence indefinitely in all the centres where they currently serve and have been forced to plan for the redeployment of personnel from five Irish centres. In a letter read out at all Dominican churches in Ireland on Sunday, the Order said centres in Dublin, Drogheda, Athy, Waterford and Limerick would have to close due to the decline in the Order’s numbers and ageing membership. The decision was taken at a meeting of leading members of the Dominicans in Ireland at their headquarters in Tallaght over three days last week. The planned withdrawal from the five centres will be implemented as part of a long-term process of consolidation of the Order’s personnel according to a spokesman, Fr Bernard Treacy, who added that at the moment there is no timetable for the implementation of the withdrawal process. The Dominicans attending the Tallaght meeting identified houses for development by the Order in Dublin, Cork, Tallaght, Newry, Dundalk, Newbridge, Waterford, Kilkenny, Tralee, Galway and Sligo. “With personnel being concentrated in these centres, it will become increasing difficult to find Dominicans who can be assigned to live and work in the remaining Dominican houses in Ireland,” Provincial, Fr Gregory Carroll said in a statement. The locations the Order of Preachers will withdraw from have been identified as St Magdalen’s, Drogheda; Leeson Park in Dublin; St Dominic’s, Athy; St Saviour’s, Limerick; and St Saviour’s, Ballybeg, Waterford. He said he appreciated that the announcement of the process of withdrawing from locations where Dominicans have served, in some cases, for centuries, is “a moment of sadness and pain”. “But it seemed best to us to announce honestly and immediately how pressing the manpower situation is – so pressing that there are some centres for which we will no longer have enough men to serve,” Fr Carroll said. He underlined that no change will occur immediately. “We will consult with the local communities from which eventually we would have to move, before anything actually happens,” he assured. Fr Carroll said the ordination of three priests this summer and the solemn profession of six men in early September are moments of real hope but he added that the fact remains that there are now only 125 Irish Dominicans in the country. The average annual intake in Ireland remains less than three and the average number of ordinations for the same period remains slightly more than just one per year. 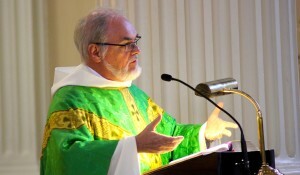 “The purpose of the reorganisation is to help make the work of the 125 more effective in the core ministries of itinerant preaching, primary pastoral care, and youth faith formation while providing for the formation of those joining the Order, and at the same time respecting traditional apostolates,” Fr Carroll said. The Order currently runs 20 centres in Ireland at present with a strong concentration in the eastern side of Ireland. The Dominicans feel its members are stretched across so many centres. The Order of Preachers, as the Dominicans are known, has been present in Ireland since 1224 when it established its first houses in Dublin and Drogheda. The Order, which was founded by St Dominic, will be 800 years old on 22 December 2016.